This video from Nicole Lampe in the Netherlands is a beautiful pictorial story of how one horse can teach each another useful skills, support him through facing his fears, and lovingly support his growth and expansion. Not surprisingly, horses don’t just assist humans to heal, they also assist each other! This is actually one of my favorite things to do with my herd – just watch how they interact, communicate and teach each other. 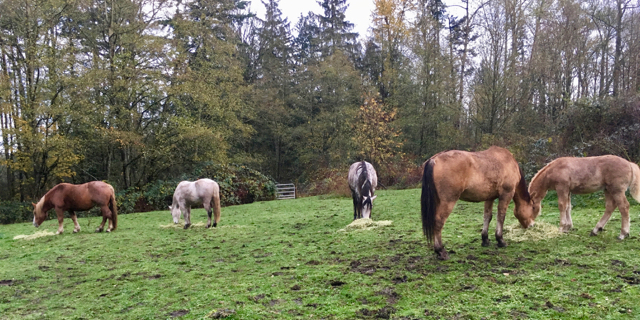 I’ve been watching my wildies gradually teach my domestic Andalusian to be more of a ‘natural horse’ and how to communicate better in native horse body language. It’s like Zorra is a bumbling thug compared to their much more subtle communication. I’ve also been watching the herd school Jax – the second-youngest Belgian/Arab cross. Like most Arabs, he is highly intelligent, but also highly playful and mischievous. Respectful behaviour is not high on his priority list, but the herd relentlessly demand he behave respectfully. And when little Juno was born, I was surprised to watch his daddy, Montaro, teach him how to listen and be directed by Montaro from Day 2 of his life. The first priority was not cuddling and bonding; it was, “When I ask you to move left, you need to go in that direction only and immediately.” He would even rouse Juno from a dead sleep and get him to move as requested. I realized that in a wild herd this is a far more crucial service than providing affection – imagine if the stallion needed the herd to run fast banking around to the right, to avoid a predator, and a new foal ran left! After Juno had learned all of Montaro’s communication/signaling, then Montaro began to show more affection and he quickly became Juno’s favorite eating partner. When you’re a Horse Listener, you realize there is an entire world of fascination, wisdom and culture to be gleaned by simply watching horses and listening to their communication expressed through their bodies, expressions, energy and movement. This reminds me of a picture wild horse photographer, Barbara Wheeler, took of a stallion on patrol with one of his foals. The baby’s head and nose were just behind the stallions eyes and ears, and the stallions ears were back telling the baby to stay in its spot. I also remember watching a new horse integrate with an existing 2-horse herd, the dominant horse was a bit insecure and so was over the top in setting boundaries with the new horse. One day after waking up from his nap, he decided to run several hundred feet across the field to get to the new horse to chase him off. As I’m watching this happen I’m thinking, hey, new horse, time to get out of here. But new horse just kept grazing. Only when galloping dominant horse was within 2 horse lengths did new horse begin to pick up a trot. Then dominant horse reached out to bite new horse’s rear-end and was within inches, when new horse fired both back feet and clocked him in the chest. You could hear the sound, and that was the end of that encounter. Horses have a way all their own, and it is fascinating to observe. Yes they do Mary – and it’s also been fascinating to watch the progression; as Juno learns the language/signals, then Montaro’s messaging has become subtler and subtler. I’ve also watched the difference between dominant/pushy (which I see comes from fear/insecurity as in your story) and boss/leader. Montaro is the leader in our herd, but he is also the one who will let ANYONE eat from his hay pile. He is supremely reasonable and the horses that eat with him are perfectly mannered and calm. If they are not, he will not tolerate their presence. So his leadership essentially demands they be their best self – NO bullying, dominance, pushing, theatrics etc. Der Nicole, not knowing how else to contact you I will try this way. I watched your YouTube Videos and I am really impressed by your unpretentious way of sharing your insights. I loved you saying ” I am not a scientist so I can say whatever I want” 🙂 Apart from the great though simple things I enjoyed the bit about the intuition. Not to grasp, but so true. The way I am trying to live with my horses has got similarities with yours (though you will have much more experience) – it feels so good not to be alone on this road!!! – If not living on a very tight budget – as many horsepeople do – I’d really love to meet up with you and learn from you in your own very down to earth, but very close to the horses way. Gold to know that you are out there! 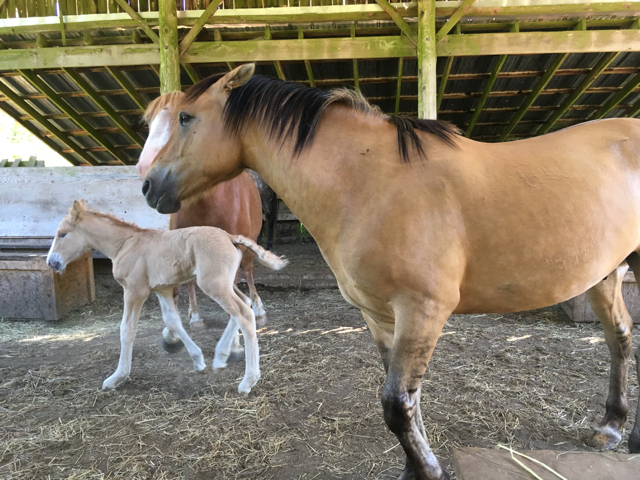 Daphne on Does Your Horse Have Chronic Protein Deficiency?